 2019 Bayliner 160 Element NEW 2019 BAYLINER ELEMENT E16 DECKBOAT! 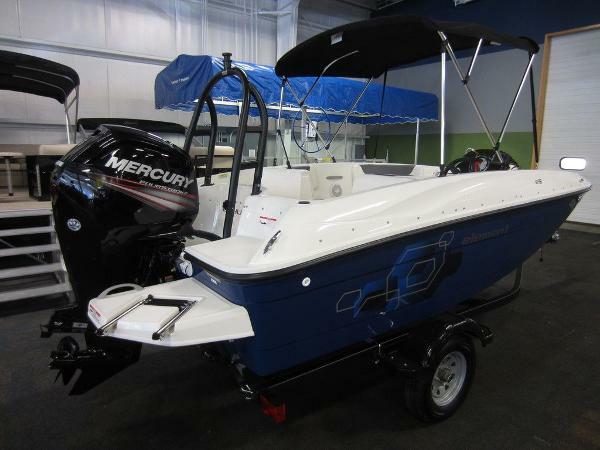 A 75 hp Mercury 4-stroke EFI outboard w/power trim powers this affordable fiberglass deckboat for only $16,992! A limited lifetime hull warranty and a 3-year factory engine warranty are included. 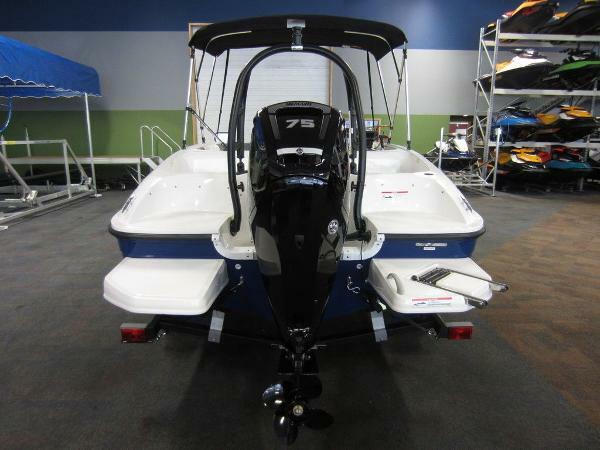 Optional equipment includes: removable bimini top w/storage boot, and Graphite interior. Features include: starboard side helm, Faria 7” dual purpose gauge w/speedometer and voltmeter, padded steering wheel, bilge pump, electric horn, navigation/anchor lights, under seat storage, U-shaped bow seating, opposing port side seating, stern port/starboard seats, driver’s seat w/under storage, stern filler cushion for sun pad, extended driver backrest pad, passenger safety handles, beverage holders, extended fiberglass swim platforms w/3-step telescoping boarding ladder, fiberglass non-slip floor, (4) mooring cleats, fire extinguisher, marine cranking battery, 12 gallon fuel tank, and 6 person carrying capacity. Also included is a Karavan bunk trailer including; swing tongue, 13” wheels, composite fenders w/steps, bearing buddies, tie down straps, and swivel jack. Trades will be considered and delivery is available. Competitive financing rates and terms are also available. Approximate payment is $183/mo. for 120 mo. with 20% down (WAC). Leaders RPM is one of the largest marine and powersports dealers in the Midwest with over 70,000 sq ft of showroom, parts, and service under one roof located in Kalamazoo, MI. Price is plus freight, prep, sales tax/fees and is subject to change without notice. All rebates to dealer. 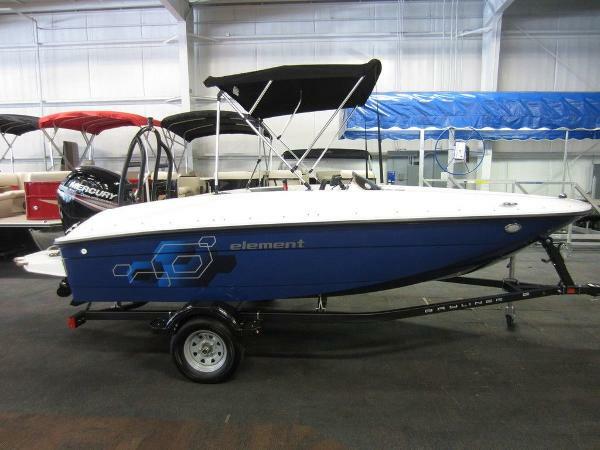 2019 Bayliner 160 Element SAVE OVER $3,200 ON THIS NEW 2019 BAYLINER ELEMENT E16 DECKBOAT! 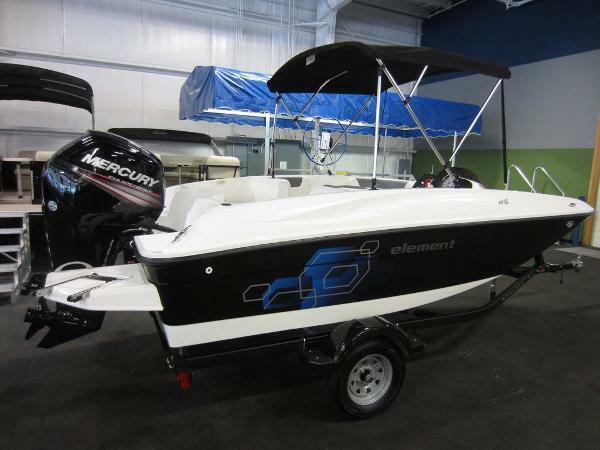 A 75 hp Mercury 4-stroke EFI outboard w/power trim powers this affordable fiberglass deckboat for only $19,244! 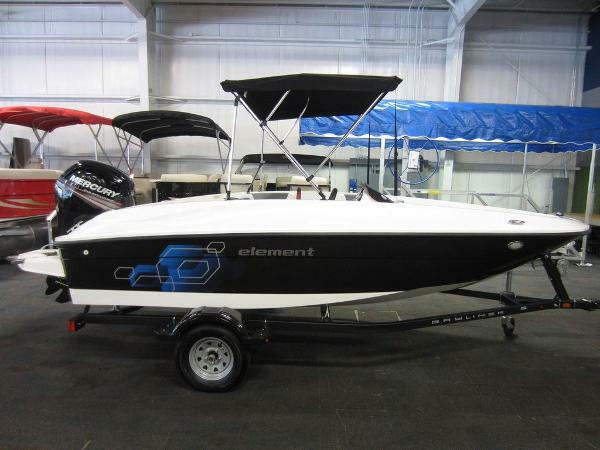 A limited lifetime hull warranty and a 3-year factory engine warranty are included. 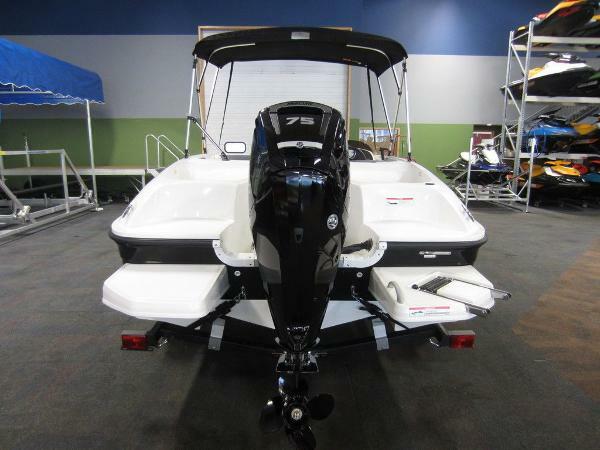 Optional equipment includes: factory installed snap-on mooring cover, Lowrance Hook 4X fish/depth finder, Jensen AM/FM bluetooth stereo w/AUX and USB inputs, removable bimini top w/storage boot, ski/tow sports arch, graphite interior, and auto bilge pump. Features include: starboard side helm, Faria 7” dual purpose gauge w/speedometer and voltmeter, padded steering wheel, bilge pump, electric horn, navigation/anchor lights, under seat storage, U-shaped bow seating, opposing port side seating, stern port/starboard seats, driver’s seat w/under storage, stern filler cushion for sun pad, extended driver backrest pad, passenger safety handles, beverage holders, extended fiberglass swim platforms w/3-step telescoping boarding ladder, fiberglass non-slip floor, (4) mooring cleats, fire extinguisher, marine cranking battery, 12 gallon fuel tank, and 6 person carrying capacity. Also included is a Karavan bunk trailer including; swing tongue, 13” wheels, composite fenders w/steps, bearing buddies, tie down straps, and swivel jack. Trades will be considered and delivery is available. Competitive financing rates and terms are also available. Approximate payment is $204/mo. for 120 mo. with 20% down (WAC). Leaders RPM is one of the largest marine and powersports dealers in the Midwest with over 70,000 sq ft of showroom, parts, and service under one roof located in Kalamazoo, MI. Price is plus freight, prep, sales tax/fees and is subject to change without notice. All rebates to dealer.